Seasonal creeks are by definition creeks that only have water during the rainy season. In California, the rainy season can potentially stretch from early Fall into late Spring, although variations in weather patterns can of course add nuance to that schedule. However, for truly seasonal creeks it usually takes a fair bit of rain to form the runoff required to start them up. So although we’ve had rain just about every week for the last month or so, it was only with the latest storm that we began to see the seasonal creeks on the Overlook Trail and the Montini Preserve begin to run. 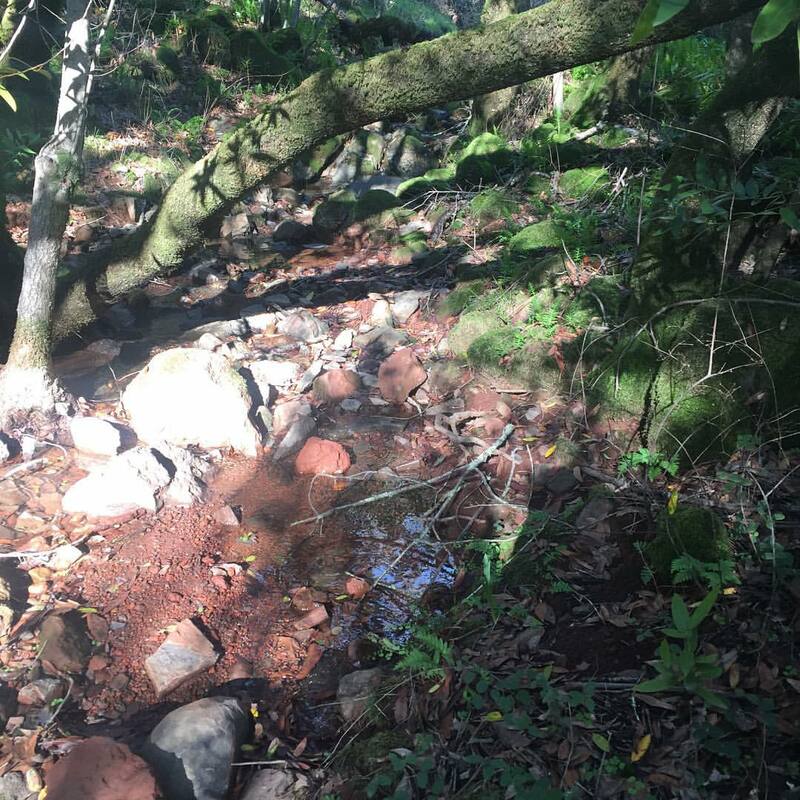 Specifically, the creek that runs through what I call “Fern Glen” and across the Overlook part of the Rattlesnake Cutoff trail, has begun to run (see pic). This is good news, as it means that our storage reservoirs will also begin to fill. And having been in a multi-year drought, this is definitely good news. However, runoff by itself isn’t necessarily good. We should trap as much of that as we can into the aquifer, where those who draw from water wells can take advantage of it. To a large degree, this means slowing down the runoff and making it soak into the ground instead of running directly to the bay. Personally, I think we have a ways to go before we can say that we are doing the best we can at water capture in this valley. Until we figure out how best to harness our seasonal creeks to maximize underground water storage, we perhaps deserve the droughts that we will likely increasingly get. 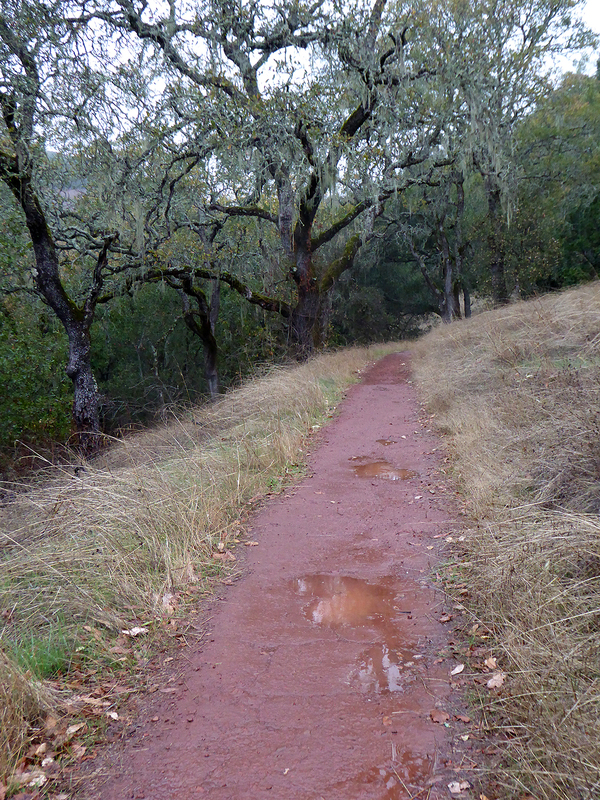 Thanks to recent rains, trails on Montini Preserve and the Sonoma Overlook Trail are undergoing some remarkable transformations. The dusty browns and golds of late fall have been replaced by winter’s verdant palette – dormant ferns are reappearing and mosses now adorn tree trunks and boulders like festive green boas while the pungent scent of decomposing bay leaves permeates the mixed evergreen forest. When we first started the SOT Facebook page five years back, local photographer Ryan Lely captured these beautiful images after a period of heavy rain. When was the last time anyone saw so much water running off the hillside? Or turkey tails in such psychedelic colors? Fortunately we’re in store for more rain this coming week. Make sure to do a little rain dance when you get to the top! “Tis the season for gratitude, and I’d like to say a huge thank you to the stewards and volunteers (Rich, Lynn, John, Fred, Joanna, Roy and anyone else I’ve forgotten) who take such meticulous care of these trails, and to the dedicated docents led by Rosemarie Marks. Let’s not forget Joanna Kemper (what doesn’t she do? ), Laurie Friedeman, our new fundraising chair, and Linda Felt who has donated upwards of 100 hours of her time to the SOT Stewards. REI made a landmark decision this year to close their stores on Black Friday. CA State Parks partnered with Save the Redwoods League to make entrance to 49 state parks free to visitors on a day traditionally spent trampling over the good will of one’s fellow man for the best deal on a Play Station 4. In honor of spending quality time with friends and loved ones outside (who needs a flatscreen when you can see clear down to the SF skyline from the top of Schocken Hill?) perhaps a few of you have put off shopping for that perfect holiday gift, the one you didn’t buy on Black Friday? Or perhaps your New Year’s resolution is to connect more with the natural world, be a more informed observer, or maybe just share your outdoor experience with young hikers. Whether you’d like to learn more about historic Native American land management practices in California, the fabulous world of fungi, the life cycle of an oak, or find out what the soundscape has to tell us about the fragile state of our planet, there’s a book for you. In celebration of 2015, I put together a very short list of a few of my favorite books with a brief (and borrowed) synopsis. I’d love to hear your recommendations! “In this influential work about the staggering divide between children and the outdoors, child advocacy expert Richard Louv directly links the lack of nature in the lives of today’s wired generation—he calls it nature-deficit—to some of the most disturbing childhood trends, such as the rises in obesity, attention disorders, and depression. “Full-color illustrated guide to identifying 200 Western mushrooms by their key features.” Arora’s book Mushrooms Demystified takes you deeper into the world of mycology. But it’s not portable! “A wonderful local history book that provides rich layers of Sonoma Valley’s past. Along with dozens of tales there are 120 Place Names and their origins.” I’ve seen this book at the Visitors Center on the Plaza. Arthur has done several training on the SOT for docents, is extremely knowledgable about both natural and cultural local history, and a wonderful story teller. Teens and adult volunteers worked together. You might think that the life of a volunteer trail steward is all glitz and glamor, and no one would fault you for thinking so. But no…it’s actually a life of picking up trash, reminding hikers of the rules, kicking loose rocks and branches off the trail, reporting trees down, and of course maintaining the property in as fine a condition as we possibly can. 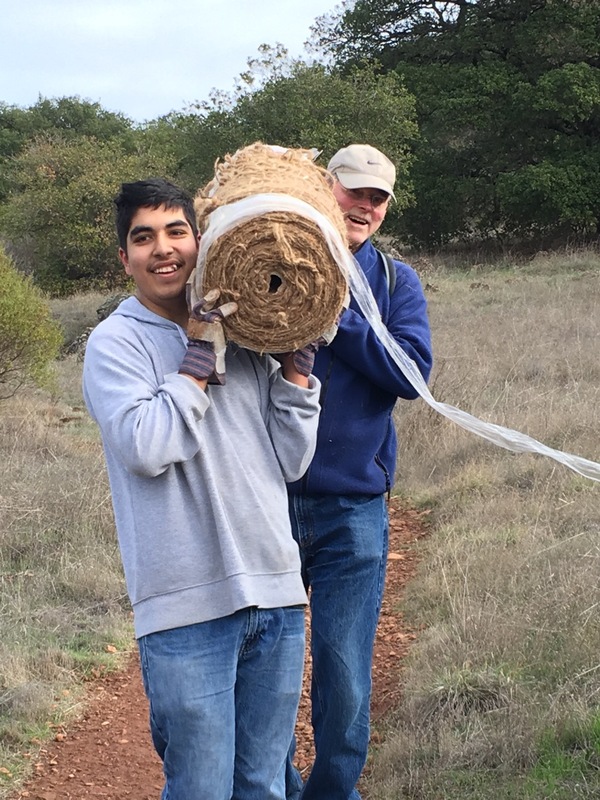 It was this last responsibility that brought out a crew of 10 stewards and Sonoma Valley Teen Services members this past Saturday to reseed and cover with straw and jute webbing a shortcut (also called “rogue”) trail. 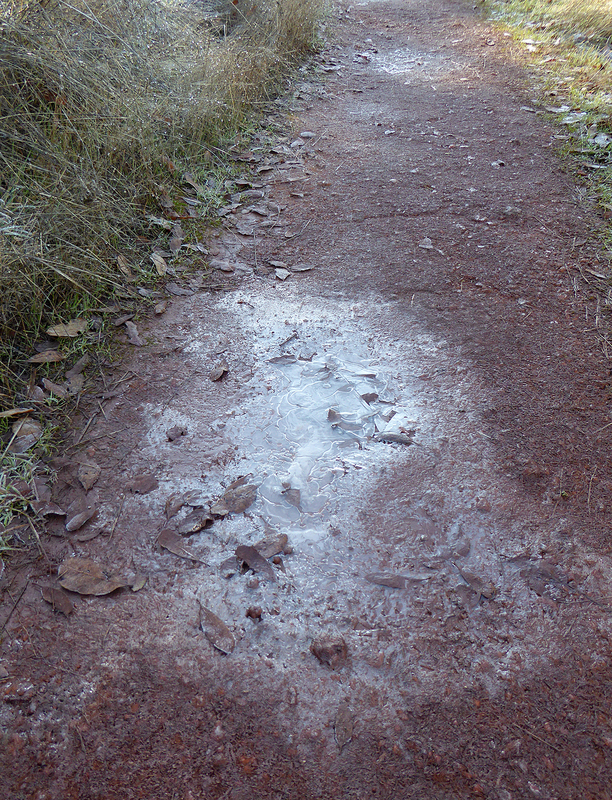 This trail is very steep and prone to erosion, as well as being a hazard for hikers who walk down it in sometimes very slippery conditions. After letting it go for a while we decided that we needed to close it off for both hiker safety as well as to better protect the condition of the property. 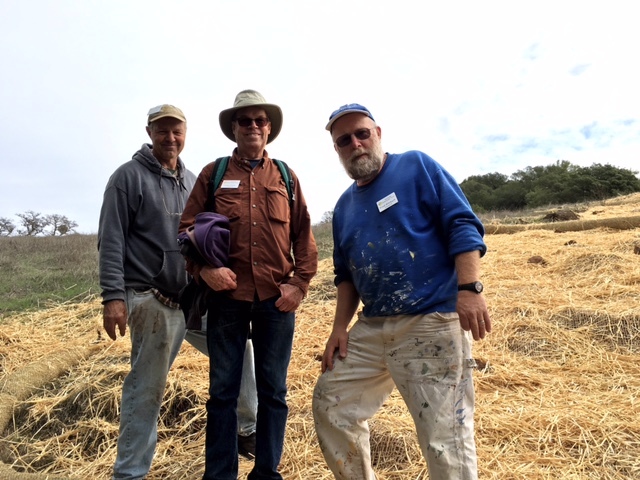 Under the direction of Steward Fred Allebach, stewards and teen volunteers hauled seed, straw, rolls of burlap webbing, and other materials to the Upper Meadow Loop. They scraped the soil to prepare it for the seed, laid down the seed, covered it with straw, then webbing, then more straw. Thankfully the rain held off until the next day. The soaking should give the seed a good start toward germinating. We are very grateful to have a partner like Sonoma Valley Teen Services with which to work with on this project, as well as the individual teens who participated. If you would like to support the work of Sonoma Valley Teen Services, see their support page. If you would like to support the work of the Sonoma Overlook Trail Stewards, donations are tax deductible and can be sent to “Sonoma Overlook Trail Fund,” c/o Linda Felt, 18782 Deer Park Drive, Sonoma CA 95476. 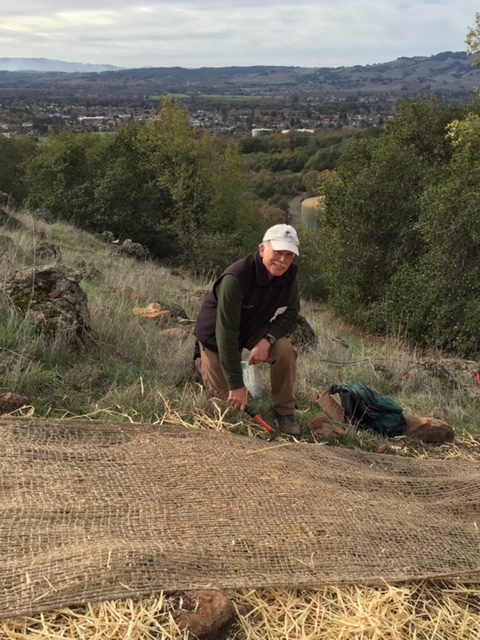 Steward John Donnelly tacking down the webbing, with the town of Sonoma below. Stewards Rich Gibson, Lynn Clary, and Fred Allebach after a good day’s work. This is the time of year when the California Buckeye (Aesculus californica) earns its name. 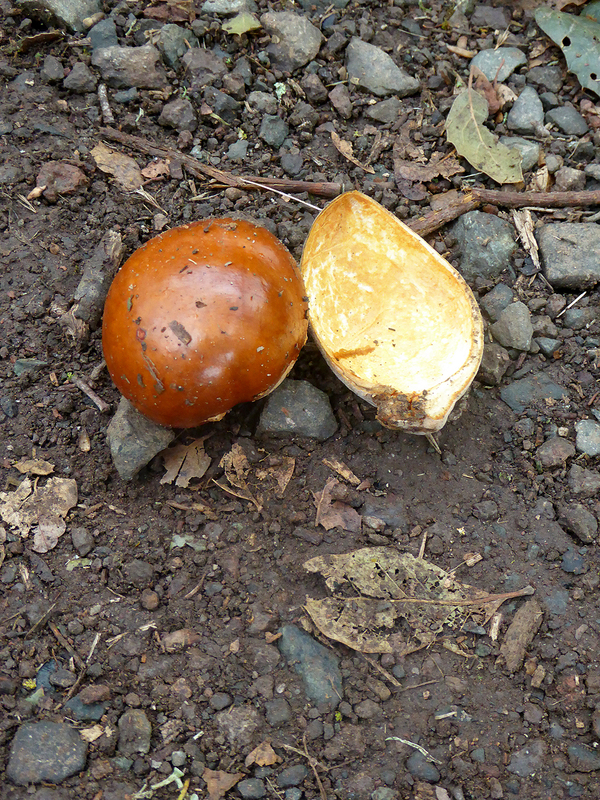 Named for the rather large seed pod they drop that resembles the eye of a deer, they are now easily found on the trail. Get them while they’re hot. We’ve been lucky so far this Fall, with rain coming almost on a weekly basis. It has been enough to both finally end one of the worst fire seasons on record as well as foster the eager growth of new grass. I love hiking the trails in the rain. There tends to be fewer people and more animals. One day in the pouring rain I saw a large flock of wild turkeys — the most I had ever seen. Out on the trail today although I didn’t see many wild creatures I saw a few hardy people and water beginning to pool and start to run off the trail. After returning home, it poured even harder. If it keeps up we my have water running in the creeks by this evening. We certainly need this moisture, but we need so much more to escape this period of drought that it’s hard to imagine getting enough in one rainy season. So let’s all hope that the rain doesn’t go away and that it soaks the ground, fills our reservoirs, and ends our latest drought.